I feel as though black doesn't mean you lead a boring lifestyle or that it is freezing outside. It just means you like black, and that is all there is to it! So this Spring, feel free to wear black if you'd like! This black Jersey Tunic Dress from Caralase has become one of my favorite black go to's. You can dress it down with some sandals, tennis shoes and a messy bun. You can also, just as easily, dress it up like I did with these wedges from Steve Madden, some gold accessories, this beautiful R.Riveter Bag, my Triwa shades, and one of my favorite black hats! 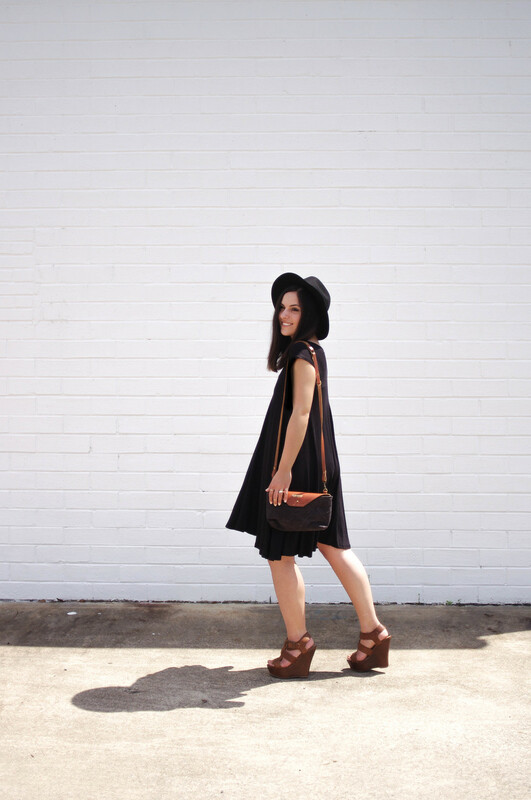 Everyone needs a fancy LBD(little black dress), but everyone also needs a comfy, day to night LBD too! I hope you all won't be afraid to wear black this Spring and have a lovely rest of your week!